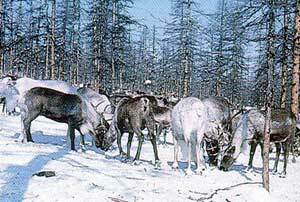 The Even breed is reared in the mountain taiga districts of Yakutia and of Magadan and Kamchatka regions. The total stock of the Even breed is nearly 550,000. 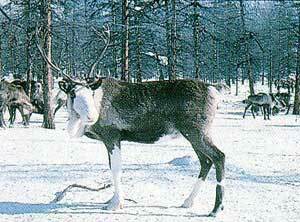 In type this breed is intermediate between the Chukotka and Evenk breeds. They are well adapted to mountainous areas, occupying alpine pasture in summer and river valleys and depressions in winter. Mountain areas are extremely varied; however in this zone the common feature ifs the comparatively short migration routes and small herd size, the latter being due to the low carrying capacity of the available pastures. The prevailing color of this breed is light brown. The average live weight of the stages before rutting season is 135-145 kg while that of hinds in autumn is 91-103 kg. The live weight of 6-month-old male fawns is 57-60 kg and of females 55 kg. The carcass weight of medium-fat adult stages if 55-65 kg, the corresponding weight of adult females being 45-50 kg; the slaughter yield is 49-50%. Intensive work is being carried out at the present times to further fix the Even breed and to investigate its genetic structure and biological peculiarities.